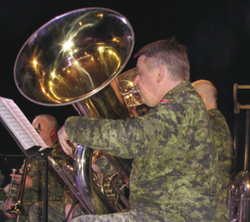 At Sacred Heart School, the Royal Canadian Artillery Band played to classes from Sacred Heart School, Norwood School, Clear Vista School, Parkdale School, Millet School, Queen Elizabeth Jr. High School, and Wetaskiwin Composite High School. The gym was packed for this outstanding performance. The RCA Band played a remarkable range of music styles, from classic to western to Scottish pipe band to Cape Breton Celtic to The Flight of the Bumblebee, and more. Some selections were played by the full band, others by a variety of ensembles and other smaller configurations of musicians and instruments. Even a vocal solo was included in the concert. The variety and quality of the music kept the students enthralled for the full hour and a half of the concert. Paul Sweet was instrumental in orchestrating this outstanding musical experience for so many students. Bands have been part of the military tradition for thousands of years. In Canada, there was a performance of over 100 musicians for the first historical performance of O Canada on June 24, 1880 on Saint-Jean-Batiste Day in Quebec City. There was an RCA Band active in both World Wars and in Korea. In 1944, the Canadian military had 10 bands active overseas. This Royal Canadian Artillery Band was formed in Halifax in 1952, then moved to Montreal when the forces were unified in 1968. In 1997, it was moved to Edmonton where it is still based. It has around 250 engagements each year, both at home and abroad, to provide music for military parades, ceremonial occasions, formal concerts, government functions, tattoos, and a variety of special events, including visits to schools. The RCA Band is a 35 piece Brass and Reed Parade Band as well as a 35 piece Concert Band, and has a number of smaller configurations such as the RCA Pipes and Drums, a Jazz Big Band, a Celtic Band, Jazz Ensembles, and Chamber Groups. Each of the smaller configurations has its own name; for example, the Celtic Band is called “McSquinties.” Many of the full time musicians in the band have multiple degrees in music and extensive professional experience. Each of them has also completed basic military training. For the students, teachers, and any others present, it was a privilege and a pleasure to witness the superb performance of the distinguished Royal Canadian Artillery Band.